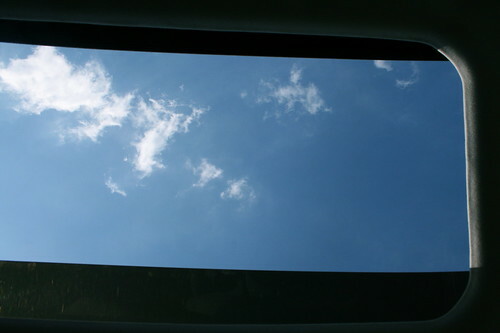 This was the view through the moon roof while waiting for Meg to come out of school. LOVE the blue skies and sunshine. I had to photograph it because it's supposed to rain here the next few days. And be colder. On a side note...we had a last minute request to view our house. 45 minutes after the start of the showing our realtor called and said they wanted to make an offer!!!! We countered this evening and will know tomorrow what they say. We may be homeless. This is giving Mickey some anxiety. That leaves me being the positive one. That's not a role I'm used to playing. Oh wow - an offer! Don't worry you have enough family around here you won't be homeless. It was a beautiful day! Hey, as long as you cook, Kelly, our house would be rent free! haha In all seriousness, Chris and I agree that you really could come to our house if you need to. We have two spare rooms! I think Chris only agreed because that would allow him to play more video games. haha I think you're right...or to get away from my cooking. Hey, sounds like a deal to me!